Your Dentist in Waco Gives 5 Reasons for Composite Bonding! Studies show that when you meet new people, one-third of them will notice the condition of your teeth before anything else. That means that if you have imperfections in your smile, you could make an unfavorable first impression. Thankfully, there are a host of cosmetic treatments for you to choose from, and one of them is cosmetic bonding. 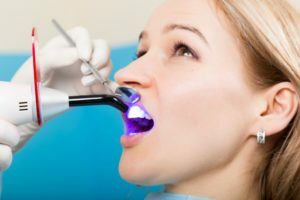 You’re wondering, “Why would I choose this over any other treatment?” Your dentist in Waco is weighing in with 5 reasons! Your dentist starts by applying the bond to the affected tooth and shaping it to match the look of your other ivories. He’ll then use a special lamp to harden the material. For the final step, he’ll thoroughly polish the tooth, leaving it looking brand-new. You’ll leave your dentist’s office with an amazing looking smile that, cared for properly, can last up to 10 years. Now that you know how the process works, let’s look at some of its advantages. Speed – With most cosmetic procedures, you may have to visit your dentist at least a couple times just to complete the treatment. With the composite bonding method, you will only need a 30-minute procedure that’s completed in one visit. Cost – If you’re cost-sensitive, this is one of the better routes to take. You’ll be able to alter the look of your teeth without breaking the bank! Less Invasive – Other procedures – like porcelain veneers – are more invasive, requiring that a thin layer of enamel be removed. The direct bonding procedure has no such requirement. Therefore, you can enjoy a beautiful smile without permanently altering your teeth. Painless – Because very little enamel is removed to perform the bonding procedure, you’ll be able to enjoy a painless treatment process. Confidence Booster – Lastly, when your smile is fixed, you’ll automatically gain more confidence. How to Get the Ball Rolling! Now that you know about one of the easiest ways ever to enjoy a beautiful new smile, all you have to do is reach out to your local cosmetic dentist in Waco. While there, you and your local professional will be able to make sure that this is the best method for you, so that soon you’ll be smiling with the utmost confidence! Dr. Rick Cofer understands how important your appearance is to your total well-being, which is why he offers a simple, yet effective way for you to experience smile perfection. A graduate of Baylor School of Dentistry, he’s passionate about putting a smile on every patient’s face at Premier Family Dental and can be reached for more information through his website. Comments Off on Your Dentist in Waco Gives 5 Reasons for Composite Bonding!